As early as 1958, it became apparent that the local high schools were becoming much too crowded as a result of the growing population in Carteret County. This was especially true for Morehead City High School, which, at the time, consisted of approximately 500 students. As a result of the growing need, a school bond referendum was voted on which included, as one of its goals, money for a new Morehead City High School. Although the school administration pushed very hard for this referendum, not enough people were aware of the demand for new facilities for the students thus causing the referendum to fail. In 1960-1961, the need for new school became county-wide. Programs offered in two of the high schools (Morehead and Newport) were very limited due to the lack of space and money. The county simply could not afford to build a new high school for each community and furnish each with the necessary equipment. Thus, the idea of consolidation began. A new high school, large enough to accommodate the entire west side of the county, seemed to be the solution to the crowded school problem. At the time, each school had a committee to student the problem; it did not take long for the two committees from Newport and Morehead City to get together to discuss the idea of consolidation. In 1962, another school bond referendum went up for vote. By this time, people of the county had become aware of the growing need for new school facilities. The school bond was passed and preparation for a new high school began. The first matter at hand was the site of the new school. Though a site had been chosen for the Morehead City High School, it was decided this site was not suitable because of the distance from Newport. A site was needed that was fairly equal distance from both schools. The two committees viewed different tracts of land, and decided on the area on which the school is now located. The next issue to be decided upon was the school curriculum. Each school had some classes and activities which the other school did not. For instance, Newport did not have a football program; Morehead did. Newport had an agricultural program; Morehead did not. A combination of the two curriculums, along with a few new programs, was woven together to for the new high school curriculum. Once the course selection was settled, the architects began planning the layout of the building. Using the ideas from schools all over the county, they designed the building to fit the needs of the classes offered. With this major segment of the planning completed and out of the way, the students could join in and help smooth out the remaining details. It was left to the students to decide such things as the school mascot, colors, seal, motto, etc. The two groups met, and, by popular vote, decided that the school mascot would be The Patriot. The colors, as would seem fitting, were red, white, and blue. The artists of the group designed the seal and the motto. The shape of the Crest of Arms is a battle shield. The crown denotes patriotism. 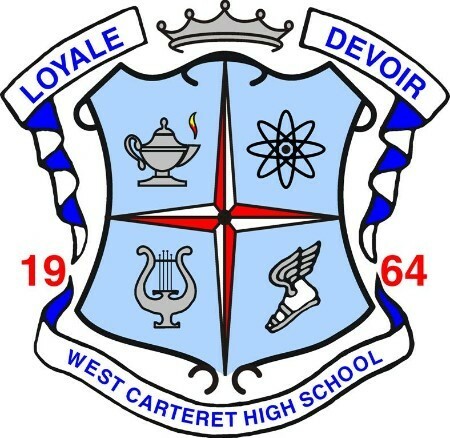 The motto, Loyall Devoir, is the seal of Lord Carteret, Earl of Granville and means “Loyalty to Duty.” Polaris, symbolic of the guiding star of knowledge quarters the inside of the shield. The symbol in each quarter of the crest represents a balanced education. The Grecian Lamp, whose light gives us understanding, denotes general education. The Atomic Symbol symbolizes science. The Lyre represents the fine arts. The Winged Foot of Mercury denotes physical fitness and fair play and is the symbol of our athletic program. The date, 1964, is the founding date of the school. The original class ring portrayed the seal on one side, The Patriot of the other, and the name of the school encircling the stone, which was a synthetic ruby. Red was chosen as the ring’s color by the first graduating class of West Carteret.